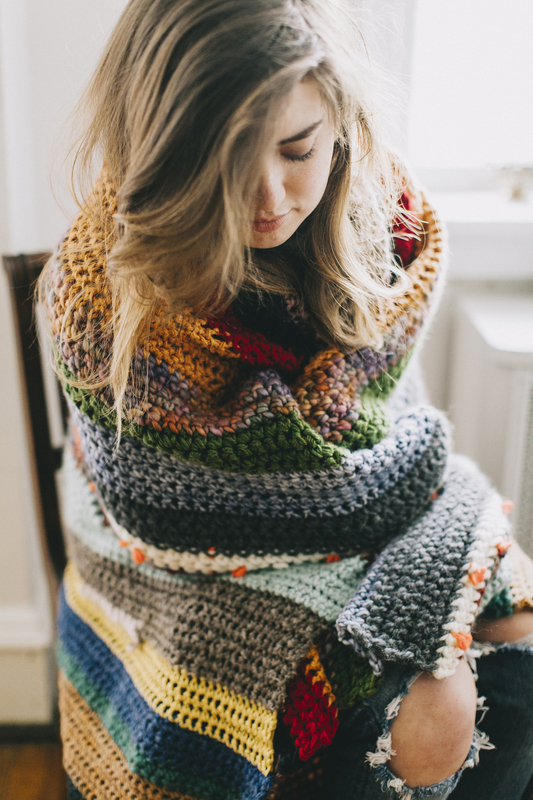 The Travel Blanket is a project that I started sometime in 2011. It's one of my most treasured possessions. I love this thing more than... well, a lot of things. I can be rather materialistic. Not so much in the way that I'm constantly shopping, getting the newest and next best thing or even hoarding stuff (though I have my moments), but there are some possessions I have that just mean the world to me. Things I love that have become a part of who I am in a way. The things we own tend to tell stories I think. Those stories are often of us. Who we are, where we've been, what we like doing, what we deem important at various points in our lives. This is intrinsically true of The Travel Blanket. In fact, whenever I have a trip planned, one of the first things I do is google yarn shops. I find the most popular one in the area, or one that just looks interesting to me, or the one that I can walk to. So yea. It's a priority. People often ask me how I choose yarn for the blanket. For starters, I always go to a proper local yarn shop, not a craft store. Craft stores just don't know what they're doing in the way of quality yarn. 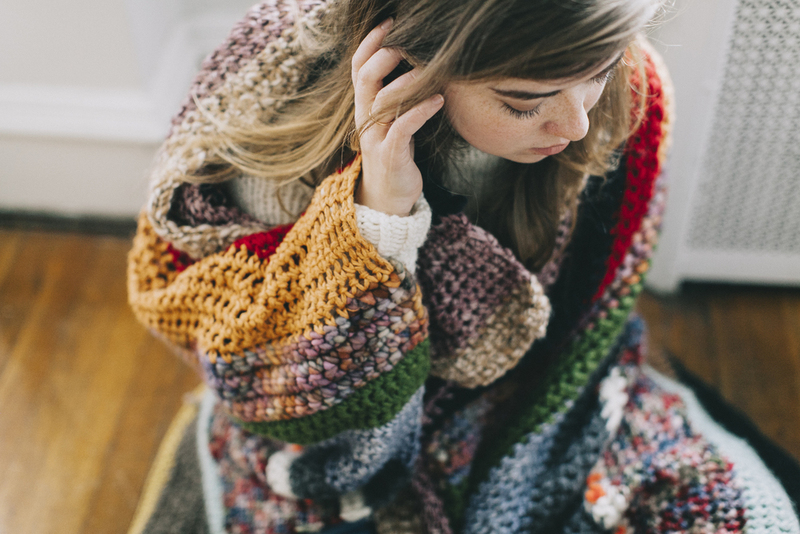 The Travel Blanket demands a more one-of-a-kind (and often 4x as expensive...) sort of yarn. I often find something unique, hand dyed, hand spun and/or exclusive to just that part of the world. And from there... well, I choose a yarn that reminds me of the place I'm in. The things I saw there, the people I met, the things I did and experienced. I sometimes have company on these little field trips, and they often think "oh, you just need like one skein right? We'll be in and out in no time". Of course, anyone who's ever visited a yarn shop with me once usually doesn't opt for accompanying me a second time. I don't know if I've ever spent less than a half hour, at minimum, in a new yarn shop. Heck, who am I kidding, even an old yarn shop I've been to heaps of times. It's just physically impossible for me. You can bet that if you drop me off and leave me with no time constraints or places I have to eventually be, I will pretty much just stay there until they kick me out. But yea. I don't usually know what I want until I see it. And seeing it can take at least a good half hour if not a full hour. I mean, I have to touch everything and hang out with it for a good long while obviously. And I almost always befriend the shop owner, and/or the other customers (who are generally about three times my age. What can I say, I'm an old soul) and we can talk about all kinds of fiber goodness for absolute ages. Not to mention I rarely buy yarn just for the blanket. I usually pick up a few other skeins that always end up catching my fancy (much to the dismay of my credit card). Besides, there's quite a shortage of good quality yarn shops here in Richmond (which is pretty much the biggest tragedy ever. I've watched about three or four now slowly close one by one over the years) so when I come across a good one I take advantage of it. I'm not really sure what I'm going to do when it gets too big to even be classified as a blanket anymore... I guess I'll cross that bridge when I come to it. But I don't know if it could ever really be as good as the original. This blanket has so many memories and stories woven into it. It's a different kind of scrapbook of my travels. A tangible and collaborative ongoing souvenir from so many of my wanderings. I think I mostly love it simply because of that to be honest.